One must be grateful to Portside for giving us these devastating bits of cruelty and hatred from what I hope is a very small band of pro-Israel elements. Surely the attack on Dustin Hoffman is anti-Semitic - how shocking to realize the source! Let me be clear - I do not think the views expressed here represent the heart and soul of the Israeli community, but only of a narrow and fanatic element within it, and within the pro-Israel American Jewish community. This essay by Martin Hart-Landsberg is one of the better historical outlines of DPRK-US relations since the cease fire in 1953. While the current leadership in South Korea is quite hard-line, there was a period under former South Korean President Kim Dae-Jung's Sunshine Policy where much progress was made toward peace and even reunification. Kim Dae-Jung won the Nobel Peace Prize. But Kim and Sunshine were never viewed positively by the US, and were completely undermined under Bush. The story of this period is told in a recently available translation ("Peacemaker"), the recollections of Lim Dong-won, the Sunshine Policy architect. This South Korean account, while sober about vexing issues presented by DPRK policy, nevertheless exposes the sabotage of Sunshine engineered mainly by the US. "Peacemaker" is now available from Amazon and many other sources, and it will be a great tool in correcting the widely believed US-concocted image of DPRK and its leadership as unreasonable and unprincipled. Add Lim Dong-won's "Peacemaker" to your essential Korean reading list, along with the books of Bruce Cumings ("Korea's Place In The Sun", "North Korea: Another Country"; etc.). Of all the valuable and much needed words of Thoreau, the most valuable -- and most needed -- and probably least known -- in today's world are his brief but brilliant talk on Captain John Brown. I am here to plead his cause with you. I plead not for his life, but for his character- his immortal life; and so it becomes your cause wholly, and is not his in the least. Some eighteen hundred years ago Christ was crucified; this morning, perchance, Captain Brown was hung. These are the two ends of a chain which is not without its links. He is not Old Brown any longer; he is an angel of light. Re: Will Cuba's Economic Reforms Succeed? Can we say "NEP," class? Let's be sure to be clear on terminology. The FBI defines terrorism as "the unlawful use of force against persons or property to intimidate or coerce a government, the civilian population, or any segment thereof, in the furtherance of political or social objectives." The most interesting point in that definition is one word, "unlawful." Stop and think about that. If you do these things "lawfully" then, hey it's okay. However, the Empire forgets that its laws are not in fact universal, it is not the only lawful actor on the world stage. Other countries, horrors, have their own laws, one country's laws are another's irrelevancy. Following that, make one change, terrorism is "the . . . use of force against persons or property to intimidate or coerce a government, the civilian population, or any segment thereof, in the furtherance of political or social objectives." With that, then one may legitimately ask "what is the largest terrorist organization in the world?" With very little analysis, the answer is crystal clear. Preferring not to wind up in Guantanamo, I leave the results of the analysis to the reader. Two of this week's cartoons focus on the Benghazi hearings. Each of them zeroes in on right-wing criticism of the Administration's handling of its response to the attacks. In my opinion, these right-wing attacks, while politically motivated -- an attempt to smear the Administration -- can be looked at in several ways. The liberal approach is the one espoused to the two cartoonists: criticize the right-wing attackers. The progressive approach, unrepresented in your choice of cartoons, would be to ask "what was the reason for the violence in Benghazi?" To this question, the answer might well be "US foreign policy." I urge you, when seeking cartoons, to find ones which look at the larger issues, the ones which transcend the narrow, provincial Republican-vs.-Democratic parameters. Yes, this is the way life should work for us. Is the mayor basing his actions on the writings of theologians such as Jose Porfirio Miranda, who decades ago wrote such books as Comunismo en la Biblia, El Cristianismo de Marx, and Marx y la Biblia: Critica a la Filosofia de la Opresion ? The US still hopes to enlist Vietnam in its "Asian pivot" against China and has partly succeeded with the competing claims over areas of the South China sea.Nine boats carrying longshore union supporters blocked a grain ship at the Port of Kalama on Tuesday morning, causing the Coast Guard to board one boat and cite the owner for violating a 200-yard safety zone. White color service employees unite; you have nothing to lose but the image that leads you to believe you are not a worker. This Saturday, May 18th - Please join us! The Veterans Peace Council is hosting an Armed Forces Day Conference on the Veterans' Peace Movement. The event will take place 9am-5pm at the Rutgers Presbyterian Church, 236 West 73rd Street (betw. Broadway and West End Ave.), in New York City. The conference is part of an extended project to answer the question: What now for the veterans peace movement? Hosted by the Veterans Peace Council; sponsored by Veterans For Peace and Vietnam Veterans Against the War; and endorsed by Black Veterans for Social Justice, Citizen Soldier, Iraq Veterans Against the War, Military Families Speak Out, and Vietnam Agent Orange Relief and Responsibility Campaign (list in formation). "Greek American Radicals - the untold story"
After its successful run in Greece, the historical documentary about the journey of Greek American radicalism, comes to the city that was the very center of labor pursuits and social struggles. The non-profit company "Apostolis Berdebes", producer of the film, has the pleasure to invite you to the first New York City screening that will take place on Saturday, May 25 at 6: 30 pm, at the Stathakion Cultural Center, 22-51 29th Street, Astoria, NY 11105. The historical documentary Greek American Radicals - the untold story presents a forgotten page of Greek immigrant experience in America: the role of immigrants in the radical labor movement in the United States and the journey of the Greek American left from the early 20th century until the years of McCarthyism. Texts, letters, songs, newspapers, photographs, and unique archival footage from film recordings of the American labor movement substantiate the narrative. Personal testimonies and interviews recreate the atmosphere of the Great Depression of 1929, the struggles of trade unions, the presence of immigrants as volunteers in the trenches of the Spanish civil war, the political persecution of McCarthyism and the deportations of the protagonists. The unknown story of Greek American radicalism as part of the political and social developments in the United States highlights the history of those who lived on the other side of the "American dream" of success and political conservatism. The documentary was based on the research of Kostis Karpozilos, historian at Columbia University, who has been working systematically with issues of migrant radicalism and social and political transformations in the years of the Depression. The film was the product of the collective efforts of a tireless creative team consisting of Kostis Karpozilos who wrote the scenario, Kostas Vakkas who directed, Epameinondas Skarpelis who did the very demanding editing, and Frosso Tsouka who managed all aspects of the production. The film is dedicated to Apostolis Berdebes, a fervent fighter for democracy in the years of the dictatorship and an active member of the Greek American community of New York until his death in 1979, on the eve of his 31st birthday. Radical Teacher is pleased to announce its inaugural on-line issue. The topic is "Occupy and Education." After 35 years of print publication we are coming out from behind the paywalls and moving to on-line, open access publication, through the University of Pittsburgh Library System. Radical Teacher issue #96, "Occupy and Education," was inspired by the quick spread of Occupy Wall Street across the U.S. and beyond. The campsites, assemblies, improvised methods of self-government, marches, slogans, and disruptions refreshed opposition to Wall Street's dominion, and set in motion many campaigns of resistance and renewal. Inseparable from such activism was a vast project of political education: workshops, courses, theoretical lectures, steaming polemics, teach-ins, posters, newspaper, libraries, experiments in democratic pedagogy, and much else. Political education spilled out of Occupy sites, not just into the streets but to campuses and classrooms, buses and subways, radio, television, the internet. This issue of Radical Teacher is about some of the political education that Occupy set in motion: about how learning tied in with action, about how it changed public discussion of inequality and of democratic possibility. It is a long-cherished plan and an ongoing adventure: the Dresdner Sinfoniker will travel to East Jerusalem and the West Bank at the end of May 2013 to perform "Symphony for Palestine" by the Iranian composer and Kamancheh virtuoso Kayhan Kalhor together with Palestinian and Azerbaijani musicians. The work is dedicated to two Palestinians: Juliano Mer-Khamis, the murdered director of Jenin's Freedom Theatre, as well as to the eleven-year old Ahmed Khatib, shot dead in 2005 by an Israeli soldier, who mistook the boy's water pistol for an armed weapon. His story went around the world, because his parents donated Ahmed's organs to five Israeli children. Inspired by these tragic events, the great Iranian composer Kayhan Kalhor combined classical Persian melodies and elements of Arabic folk music with the sound of a European string orchestra. The orchestral piece includes traditional oriental instruments such as Arabic violin, Oud, Kamancheh, Darbuka and Qanun. For many years now, the Dresdner Sinfoniker have been strongly involved with contemporary music and Oriental culture, and in this ambitious project they take on the role of mediators between Oriental and Occidental music traditions. Despite numerous obstacles they will travel to the West Bank to bring their ambitious musical project to the region, which initially inspired it. Dresdner Sinfoniker with Mehri Asadullayeva (Kamancheh), Kamil Shajrawi (Arabic violin), Nermin Hasanova (Qanun), Emil Bishara (Oud), Naif Serhan (Percussion). "Symphony for Palestine" is sponsored by the `Kulturstiftung des Bundes', the city of Dresden (department of culture and heritage), the `Kulturstiftung des Freistaates Sachsen' as well as the `Kulturstiftung Dresden der Dresdner Bank' and is a co-production of the `Dresdner Sinfoniker' and Ben Deiá. I do not believe it is necessary to talk at length about the need for a strong left in the USA, how weak we presently are, and the long fractious history of periods of lack of cooperation among us. This event, with seven different participating organizations, is not seen as a stand alone event. It is hoped that it will lead to not just broader discussions but more concrete steps towards unity of action as well. 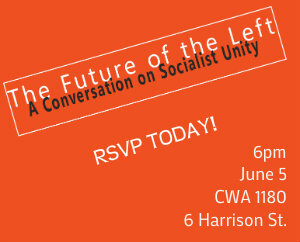 With Mark Solomon of the CCDS leading off based on his widely circulated and discussed article in Portside and respondents from Jacobin Magazine, Democratic Socialists of America, CPUSA, and Freedom Road Socialist Organization, we think this will be a most interesting initial dialogue. Another unique aspect of this event is that we intend this to be a relatively brief program. The reception to follow will be of equal importance so that everyone attending the program can have an opportunity to interact with the panelists, and each other. Since February, prisoners at Guantanamo have been on hunger strike.World Can't Wait has been pondering hard on what more we can do to create a political situation where Obama has to back down, release at least a few of the men at Guantanamo, and be forced into closing the prison. All of our frequent protests, petitions, call-ins, editorials and op-eds are part of what's needed. The major missing ingredient in this moment, though, is the collective voices of artists, intellectuals, politicians, religious and cultural figures who are respected and beloved for being voices of conscience, speaking as one to demand that the torture of Guantanamo be ended. *It's time and past time, as we reach 100 days of the prisoners' hunger strike*, that we provide a way for them to speak out together, and for that message to be seen. which could serve as such a vehicle. It has been signed by over 1000 people in the past week, including John Cusack, Wallace Shawn, Junot Diaz, Noam Chomsky, Daniel Ellsberg, Eve Ensler, Dave Eggers, Glenn Greenwald, Paul Haggis, Bianca Jagger, Ariel Dorfman, Erica Jong, Moby, Michael Moore, Ron Kovic, Tom Morello, Mark Ruffalo, James Schamus, Laura Flanders, Oliver Stone, Cindy Sheehan, and Cornel West, joined by attorneys for the Guantanamo, prisoners, law professors, clergy and academics. Because we can only afford an "advocacy" rate at /The Times/, at $52,030, which runs on a stand-by basis, it's urgent that we submit the ad as soon as possible. The prisoners' hunger strike is the dynamic factor making any change possible in the administration's action to release them. The message powerfully challenges us to look at Guantanamo as "part of larger, alarming developments" including the NDAA, targeted killing by executive order, and the prosecution of whistle blowers, "most flagrantly in the torture, slander and draconian legal charges against BradleyManning." It says, "It is up to people to stand up for principle and morality when their institutions and public officials refuse to do so. The fates of those who are maimed or killed by our government's policies are inextricably intertwined with our own: we must listen and respond to their cry for justice. We must demand their release now, before they lose their lives as well." We hope you will sign on, and help fund this project so that we can go to print very quickly.